A bronze figure by Yu Zuokun depicts the Peking Opera character Zhao Yun, a military general who lived in the Three Kingdoms period (220-280). 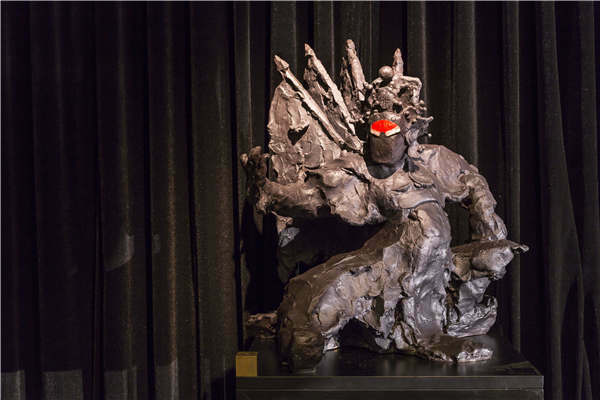 Much of Yu Zuokun's perception of the world stems from a childhood spent watching Peking Opera shows at an outdoor theater, an experience that has heavily influenced his artistic expression since Yu began his career as a sculptor a decade ago. This is evident at Yu's solo show, being held at the National Center for the Performing Arts in Beijing, where dozens of bronze figures depicting characters from traditional Chinese operas－including well-known figures such as Guan Yu from the Three Kingdom Period (220-280), one of the best-known generals in China's history, and Yang Guifei, regarded as one of the four beauties of ancient China and the beloved consort of an emperor in the Tang Dynasty (618-907)－are on display. Adding to the theme, the sculptures are placed against a backdrop as if they are performing on a stage. Yu creates his sculptures by employing xieyi, a technique promoted by ink painters in ancient China to draw the spirit of things instead of depicting all the details to make it real. "Xieyi style gives Yu's sculptures a feeling of contemporary art," says Zeng Hui, curator of the show and a longtime friend of the artist. Zeng notes Peking Opera bears much that style in its performance. For instance, opera performers waving whips in hand mean they are riding a galloping horse, while several actors standing in a line represents a whole army. Yu's work simplifies the face of each sculpture, depicting the figure without eyes, noses or mouths, leaving the viewer free to imagine the character's ideal features in their mind, adds Zeng. The Xiamen-based artist uses clay to mold all his sculptures by hand, a process, he says, records the time, because he has to add pieces of clay one by one, leaving his fingerprint on each. Yu was born in a village in Ningde in Fujian province. His fascination with clay comes from his memory of not wearing shoes as a child and feeling the earth directly. He used to follow farming cattle across the fields and he was captivated by the animal tracks in the mud. "I have a special emotional connection with earth," says the 40-year-old sculptor. Compared with some artists, Yu is slow in producing works. The sculpture of the Goddess of the Luo, a beauty worshipped during the Three Kingdom period, took the artist six years to create. He can't remember how many times he sculpted it, rejected it and started again. He calls the process "a practice to cultivate his inner mind". Just like a good Peking Opera actor who has to practice his skills for a lifetime to stage a perfect performance, Yu says he needs time to produce the best one. Like most families in his village, Yu's could not afford to buy a TV when he was young. The village's outdoor theater, which regularly presented traditional Chinese operas, was his main source of information about the world and where he learned history. He has since kept the habit of listening to, as well as watching, Peking Opera pieces. Although figures in Peking Opera feature colorful costumes and faces to offer strong visual effects, those made by Yu are exactly the opposite, created with a single color and without faces. "It's the core of oriental aesthetics to be restrained. The beauty is not at the first sight," Yu explains. "The more you look at it, the more magnificent it feels." Yu has devoted his past decade to recreating and re-imagining the opera figures that shaped his young mind. Now he is ready for his next phase: a series of landscapes also imagined in the xieyi style, the first of which is also on show. The 2-meter-high bronze sculpture with green mountains, boats and clouds took him two years to complete. "It's more difficult than creating figures," Yu says. "But I know nature well because of my rural upbringing." In the footsteps of many landscape artists before him, he plans to travel across China to witness the country's splendor and see the mountains for himself. "It's not only important to see them with one's eyes," he says, "but just as important to feel them in one's heart." 9:30 am-6:30 pm, through May 19. 2 West Chang'an Avenue, Xicheng district, Beijing. 010-6655-0000.